I recently turned 29 and created that obligatory “30 Things To Do Before Turning 30” list. I’m not going to post it publically, since it would probably be more embarrassing than empowering if I did that, and every time I’ve mentioned it out loud to someone I’ve been met with scorn or eye-rolling or a demand for me to list everything on there and explain the point of each activity. But one thing high on that 30 Before 30 list that I expect would or at least should not be met with irritated groans and whistles through the teeth is this one: Read all of Kurt Vonnegut’s work. 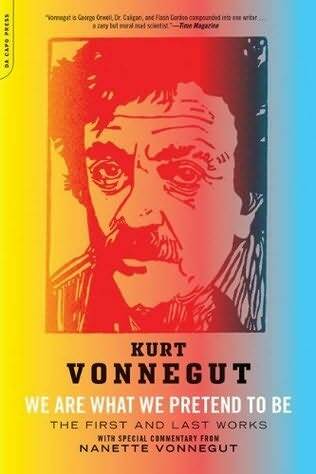 I’ve set out to read all of Kurt Vonnegut’s writing, or at least what I can get my hands on. This includes 14 novels, 16 collections, 1 collection of letters, and possibly 20+ stories that aren’t collected (if I can track them down) and 7 plays (again if I can track any of them down). I don’t hold a lot of hope for the uncollected plays and stories, but certainly the others I’ll get through. And the ones I’ve already read, I’ll be reading again. I took the first step toward this goal this weekend when I read We Are What We Pretend to Be, a collection of two novellas, his first and last works. The first of the novellas, Basic Training, which was never accepted for publication, was written when Vonnegut was close to 30. The second one, If God Were Alive Today, which is really an unfinished novel, was conceived when the author was 78, seven years before his death in 2007. Just like Nanette’s daughter, I’m somewhat relieved to learn that he wrote this first novella when he was about the age I am now. That too fills me with hope, that we’re not shackled to some strange expectation of accomplishment by meaningless age markers. What struck me about these two novellas was the dramatic shift in voice and tone. Basic Training was a nice, compelling little read, but had I not known it was a Kurt Vonnegut story, I might not have ever made the connection, and I might not have continued reading at all. There are certainly little hints of his coming voice, little nuances of wit and commentary that would later become his hallmark, but it was obviously the very beginning of his point of view, and it came from a more innocent, nostalgic place than some of the later works I’ve read of his. I haven’t read his early novels, so I’m interested to see how this novella relates in voice to those earlier works. The second novella, If God Were Alive Today, had all the trappings of what you think of when you think Vonnegut: a sharp wit, irony, a love-hate with his country, a complex simplicity of language and rhythm. His choice of characters, his political opinions, and his views of society, though far more cynical but not void of love, had certainly cooked and boiled over in the 50-year span between the two novellas. And if he had been around for another 50 years, I’m sure his voice would have continued to shift and expand. The time it takes for any writer to find their voice is unique and specific to them, whether they find it at sixteen or sixty. And even when they find it, it will continue to grow and shift as the years go on. Which should fill us all with hope – that as long as we’re working at our craft, even through years of work with piles of rejection letters, we’re shaping our own voices and perspectives – even if we don’t know what they are until we write them down. Writing is a vocation, not a career. Thank you for the post celebrating one of my favorite writers. There was a piece concerning him, Joyce Carol Oates and one other writer that I forgot that was quite good… It had to do with how Vonnegut was slightly more cynical and seemed more experienced, more real, than the other writers. This entry was posted on June 1, 2014 by Eclectic Voices in Blog and tagged #eclecticvoices, Arts and Entertainment, author, Basic Training, Chelsea Sutton, If God Were Alive Today, Kurt Vonnegut, novella, We Are What We Pretend to Be, Wit, writer, writer's voice.